EasyPost brings together 100+ shipping services. The article discusses WooCommerce FedEx Integration through EasyPost API. ELEX EasyPost Shipping Method Plugin helps you integrate FedEx services to your WooCommerce store. Additionally, it provides live shipping rates, tracking, and label printing for services like UPS, and USPS too. ELEX (under the brand of XAdapter) is an EasyPost Approved Integration Partner and EasyPost Shipping Method Plugin is developed within in this partnership. The plugin currently provides services from FedEx, UPS, and USPS which simplifies your WooCommerce shipping needs. A recent update in the plugin includes the sender country field, which enables users from different countries to use the plugin or send packages from a location different than the WooCommerce default location. Small Businesses- FedEx provides fast and affordable shipping solutions for small business and shipping rates are tailored based on the shipment volume. With FedEx Ground, you get to ship packages within a day across the United States. FedEx provides all the tools that help you effectively master shipping of your parcels. As you are aware shipping rates are highly affected by weight, dimensions, and handling, FedEx shipping expert helps you come up with a price friendly packaging. And after you are done with packing, you can schedule a pickup for all of your packages. Return labels ensure a great customer experience and with FedEx, you can make returns convenient than ever. International Shipping- As you know that 96% of World’s customers live outside of the US, I don’t need to explain why any business would want to expand its business to these customers. FedEx guides you with step by step instruction to come up with product, market and price analysis before you go international. And then you can choose the right FedEx shipping service for the different customers. For international shipping, you get details of all tools, solutions, and documents you’ll need. You get the latest regulatory and customs alerts along with regular services. FedEx also provides few educational programs which educate you about the right practices. Normally, you can be sure of the availability of all importance services. When you use FedEx services with EasyPost you add the same account and services you have activated with FedEx. And all the postage you use is charged from your FedEx account. So there is the much-required privacy too. Here is how you can integrate your FedEx account to EasyPost. 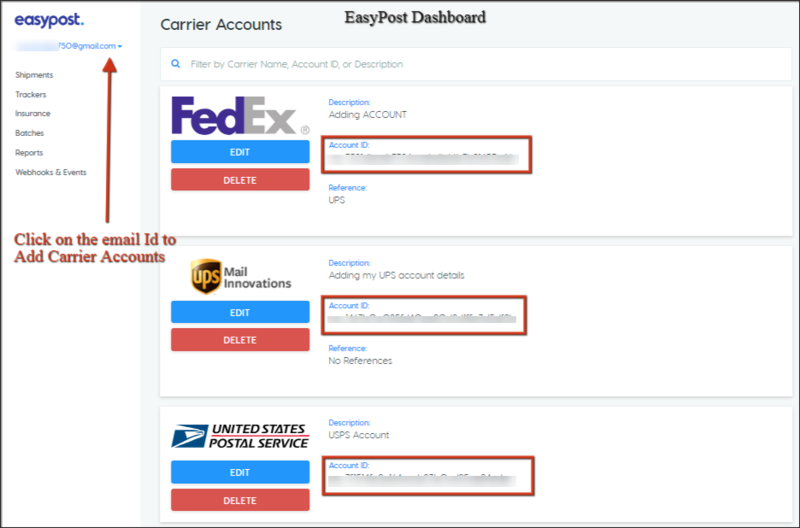 The following types of service account holders can easily integrate their account to EasyPost Dashboard. In the case of FedEx, you have the option to go with the plan you already have with FedEx. After successful addition to your FedEx and UPS account, you can now see them. (screenshot below). 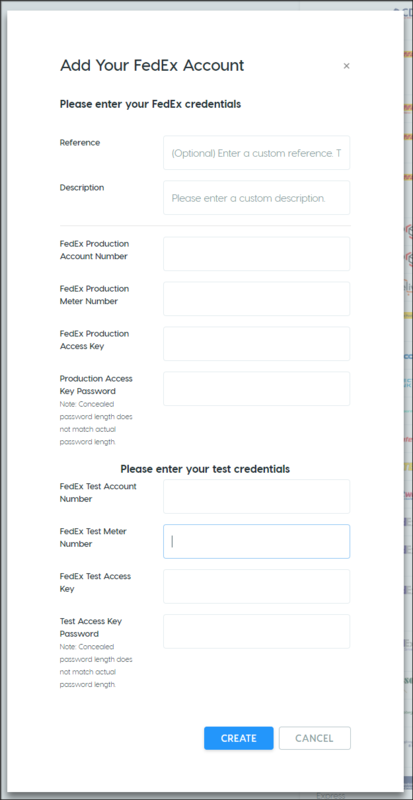 The account activates only if you enter the correct FedEx credentials. You can obtain you FedEx credentials once you Open a FedEx Account. This integration works best when you have a similar billing address to that of your EasyPost account, your FedEx account, and your credit card’s billing address. For any assistance in adding your account,s you can contact EasyPost expert via the email support@easypost.com. Once you add you add the account you are good to go. First and foremost Enable the Real-time Rates in the general settings. It is the only checkpoint in the entire set up of the plugin where the EasyPost and other services connect with your WooCommerce store. This adds simplicity and ease of use as now you don’t have to enable services of all the carriers individually. This is one of the reason, we mention the EasyPost Shipping Shipping Method as one of the advanced shipping integration in all of WooCommerce. And finally, in the General Tab, switch to the “live mode” to start showing rates to your customer. Here, you should keep in mind that your customer doesn’t interact with the test mode. 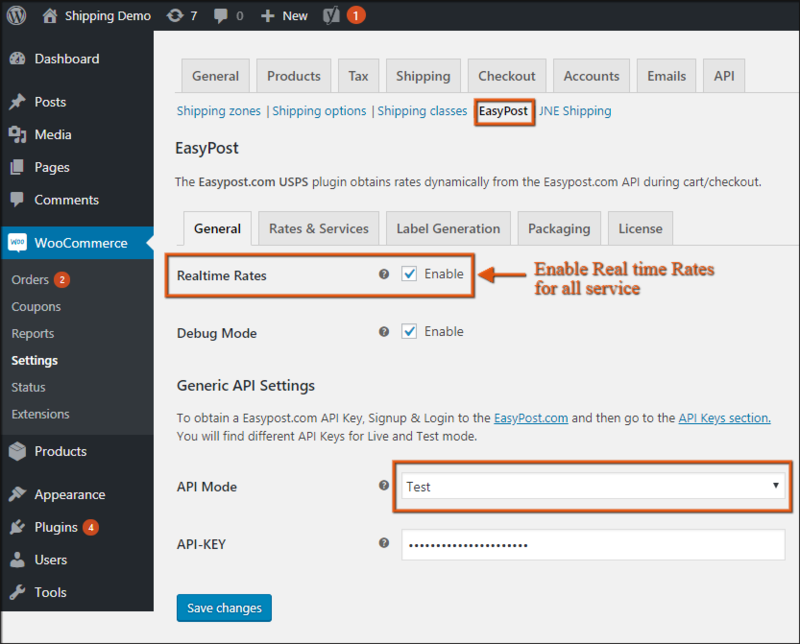 Enabling Real-Time Rates with EasyPost. This enables real-time shipping rates for all of USPS, UPS, and FedEx. Second place to look for FedEx Setting is the rates and service tab. Look for the following settings in this tab. Sender Location and ZipCode– This acts the location from which the packages will be picked up by the carrier services. So keep the ZipCode and sender location where your warehouse is located. EasyPost Carrier(s)– Select FedEx from the drop-down that appears. This will add FedEx shipping rates and services to the cart page and checkout. The plugin also has the feature where you can adjust the real-time rates based on a Dollar some percentage of the real-time rate. For instances, if you real-time rate is $5 and you add $1.5 in the first box, the customer will see an elevated shipping rate of $6.5. Similarly, 5% in the second box will add 5% of the real-time rate. If you want to offer a reduced rate use negative sign in the entries. Finally, click on save changes to enable the settings. Format of Label– Based on your preferences you can go for PDF or PNG. Details of Sender Address– Fill in the proper and valid details of sender location. Customs Description– Enter a customized note that you want to appear on the label, a requirement in case of international shipping and shipping dangerous goods. Return Address– Finally you can enable return address for your packages. As this feature is available with FedEx this will add to customer satisfaction. As you can send perishable, dangerous goods and other goods with FedEx, you get resources that helps you pack all of them, good enough to ship without issues. Dimensional weigh packing is used by FedEx to ensure you use minimum resources and pay the minimum shipping charges. With FedEx, the packing prices include the packing service, the packing box, and the material. If you don’t have enough packing resource, FedEx Pack Plus counter helps you handle any of you hard to pack product. It offers Standard boxes and Specialty boxes to pack special products. With EasyPost Shipping method you can assign such boxes with ease. You just need to add custom boxes by choosing the option “pack into boxes with weight and dimensions”. Another option available here is ‘pack item individually’ which will show FedEx shipping rates for the package with one item in each of them. So if you sell items that can be packed in one box, assign boxes to pack them. The FedEx rates, in this case, is calculated based on the weight and the dimension of the box assigned. With receiving of orders, the admin of your WooCommerce store can click on the order number to see the details of the orders and generate packages and finally print labels for FedEx from within WooCommece. So start with clicking on Dashboard> WooCommerce> Orders> #Order Number. The first thing you’ve got to do here is scrolling down to the bottom and click on ‘Create Package’. This creates packages for the items in the order. Now you the dialogue box, where you ‘create shipment’. With this integration, you saw that WooCommerce FedEx services are quite easy to use when compared to an individual plugin for WooCommerec FedEx. Not only this you get services of UPS and USPS, which again is a unique feature that you can add to your WooCommerce store. With EasyPost, you don’t require to send a minimum number of the shipment to get discounted pricing. Interestingly, you can start by sending one package and still pay a shipping rate that only business customers pay with the automatic USPS account created by EasyPost. Payment with EasyPost is of the form ‘Pay as you go’ and cost you 1 cent per package. The service provider you choose during the label printing takes care of Packing, Tracking, and shipping. For more information visit the Product Page of ELEX EasyPost Shipping Method Plugin or you can follow the Documentation. Or you can contact our Online Support for pre-sales inquiries or concerns. Happy Selling!